South Africa has officially entered a technical recession. “It is important for the average consumer to understand how the decline in economic activity affects them. Higher fuel prices, rising inflation and earlier in the year the VAT increase, all of these are a hard knock to the consumer’s purse. This spell requires us to manage our personal finances sternly, and good financial behaviour is a proactive approach that could see us through,” CEO & Ombudsman for Banking Services Reana Steyn echoes. The statistic reflects a mix of card cloning, card swapping, deposits not reflecting, ATM money not dispensed and phantom withdrawals, amongst some. “We urge bank customers to be vigilant, in especially the Eastern Cape, Free State and Gauteng provinces, as the demographics show an alarming rate of reported complaints from these regions. Furthermore, women and the elderly seem to fall victim to card swapping and cards stolen, and we suspect that they are seen as “soft targets, so they need to be extra careful in handling their cards and around ATM’s” reiterates Reana Steyn. *Mr Khoza, the complainant, alleged that he attended at an ATM and attempted to withdraw an amount of R 5000.00. According to him the ATM did not dispense the funds however his bank account was debited. With no satisfactory resolution from the bank, Mr Khoza lodged a complaint with the OBS. We requested the bank to furnish us, inter alia, with the ATM balancing report to ascertain if the ATM balanced on this day. The report received from the bank indicated that the ATM did not balance. The code of banking practice requires that the bank provides reliable, safe and secure banking and payment systems services. Based on this we recommended that the bank refund the complainant the R 5000.00 as the fact that the ATM did not balance indicated that there may have been a problem with the machine on the day in question. We argued that the benefit of the doubt ought to be given to the complainant in this instance. The bank accepted our recommendation and the complainant was refunded. The complainant, *Mrs De Wet, alleges that she was withdrawing R1500.00 at the ATM and received a phone call whilst transacting. She became distracted and walked away from the ATM to talk on the phone. Upon realising that she walked away from the transaction that was still in progress, she went back to the ATM, however the money was dispensed, and it was gone. A bank employee was at the adjacent ATM as she was assisting customers and Mrs. De Wet was of the view that the bank employee took the funds, which the bank employee denied. Mrs De Wet submitted her complaint to the OBS. After conducting a detailed investigation and assessing the mater, the OBS concluded that there was no proof that the employee stole the money. The complainant was distracted and negligent while transacting at the ATM. She at her own accord forgot the money at the ATM. The bank or the employee cannot be held liable without solid proof. Cancel your ATM card immediately if it is stolen or retained by the ATM. Remember that every second counts, so the best advice is to immediately start dialling the number provided on the machine, even before moving away. Other customers will understand that there is a crisis. “The last and main message we have to give, is for bank customers to be vigilant and responsible. Rather adopt the good behaviour to protect your money than to go through a loss and inconvenience of trying to recover it. 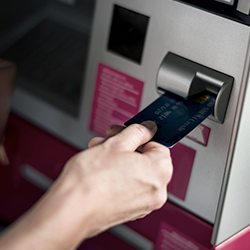 Vigilance is required whilst one is at the ATM, but so is the discipline of reading your bank statement or receipt from the ATM machine important. It enables one to notice and to act on irregularities promptly.,” says the Ombudsman for Banking Services, Reana Steyn. *Names have been changed to protect the confidentiality of the complainants. Consumers can contact the office of the Ombuds for Banking Services for free assistance if they experience any banking problems or would like to lodge a complaint against their bank.